Having not exhibited in the UK for some years Jack Everett has arrived at printing geometrical solid wooden blocks onto paper. With the sculptors urge to tell the narrative deep within the tree, these prints form a large body of work that explore how grain patterning exposes structure in surprising ways. 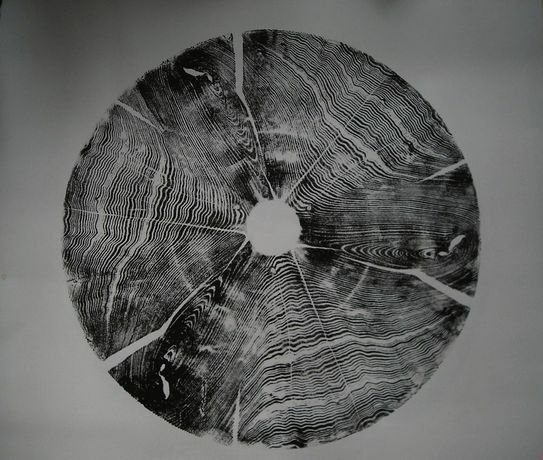 By burning and brushing out his woodblocks and rotating them on large papers a whole new growth story is revealed, giving imagery to the notion that ‘trees too talk’. With these prints it feels that a whole new language is being accessed with geometry as the translator. Moving from monochrome into colour not only enhances the patterning captured within the grain but lifts the prints into becoming three dimensionally profound. This is new territory within the tradition of woodblock printing.